Luckily to get premium Indian tea we don’t need to travel as far. During the Easter break I found myself exploring one of the biggest cities in the world which cultivates tea drinking traditions for centuries. Borough market is probably the most well known food market in London attracting locals and curious tourists (now including me too!). Vibrant and colorful, it offers everything from fresh Italian pasta to delicious duck sandwiches to Croatian specialties and, well, premium tea. “Do you prefer strong tea or rather soft?” his second question came. “I like softer taste”, I replied. And a couple of moments later I slipped a pack of first flush Darjeeling tea into my purse bought for 4.99£. Ratan instructed me not to use any tea strainers for this tea and to pour a splash of cold water on top when making it. Indeed, a very light taste of pure black tea. Darjeeling was first introduced in 1841 by Dr. Campbell, a civil surgeon who brought tea seeds from Kumaon hill of North India and planted near his residence in Beechwood, Darjeeling. 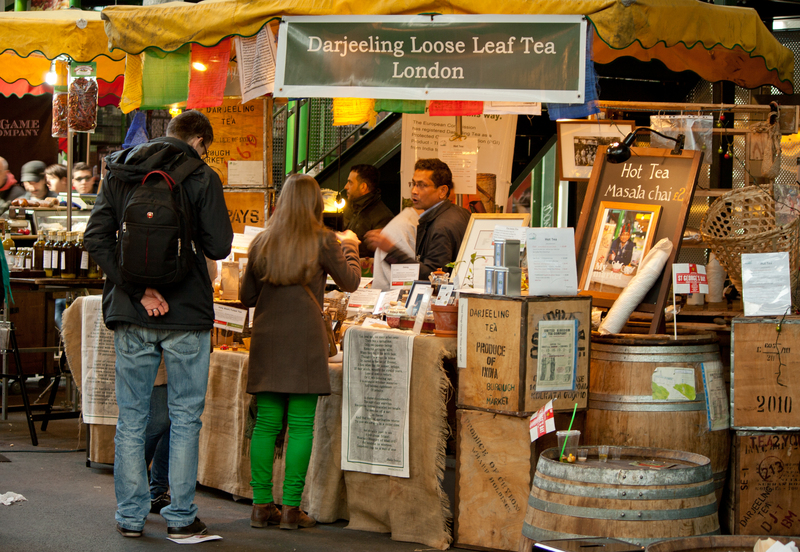 Real Darjeeling tea is grown in North-East of India at 6,000 feet above sea level in the Himalayan foothills. Only human eyes can choose the very best tea leaves. Hence, it is normally hand-picked. The European Commission has registered Darjeeling tea as a Protected Geographic Indication (PGI) product – the first commodity from India to set such a tag. This implies that the brew produced only in Darjeeling can be sold as Darjeeling Tea in the EU countries. 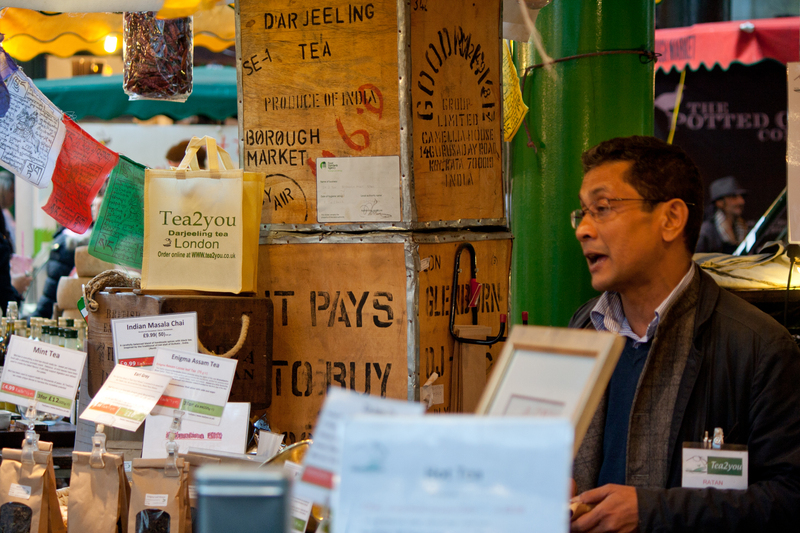 Find out more about Borough market and read a short story of how Ratan Mondal came into the tea selling business.